IPS Screen possible in W520? Are there any IPS screens that will fit and work with the W520? Does not have to be a simple plug and play option but obviously that is preferred. There's a LG panel that works but requires some mods to the cabling in my understanding. I'll post the link to it sometime later today or over the weekend. I've found a thread where you mention the panel model but not the thread regarding modification of the connector. Please do post the link when you get a chance. In the meantime, I'll keep searching. I used one of them for the IPS mod on my Alienware. Works great. Also keep in mind that the LG IPS for the T510 does not cover sRGB or AdobeRGB. A part of the problem is that the IPS mentioned in that thread have "Face mounting holes" , while the W520 have "side mounting holes" , and also different connector positions, otherwise, it should most likely work. I am curious too if there is any info from someone making that upgrade (from face mounting to side mounting holes), and the connector position. 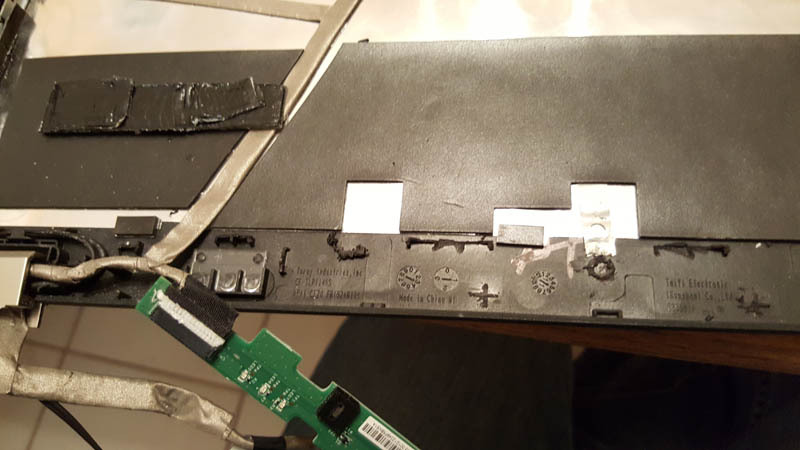 Bad thing is that if you are looking for the LG LP156WF4-SLB1, that screen is not made anymore. And most sellers are selling only a "compatibile screen", i.e. some random TN panel with the same connector and mounting holes. I recently did discover that the screen is discontinued , but I'm sure I can come across a genuine used LG screen. This side mount vs face mount issue is news to me. I know others have done this mod, any input? As much as I hate custom mounting I'm probably still going to go through with this. Carthik wrote: but I'm sure I can come across a genuine used LG screen. ...if you find more of them, let me know; I'm interested. Would be even nicer if someone could get a WUXGA (16:10, 1920x1200) to work in W520. Enough empty space in lid. Camera can be eliminated as well if needed. Problem is that WUXGA = [ 1920x1200, 16:10 and 15.4" ] and FHD = [ 1920x1080, 16:9 and 15.6" ]. Those screens have different dimensions, looks like the WUXGA would be too big/high. Probably a modded lid/bezel might work, but it would an expensive mod. 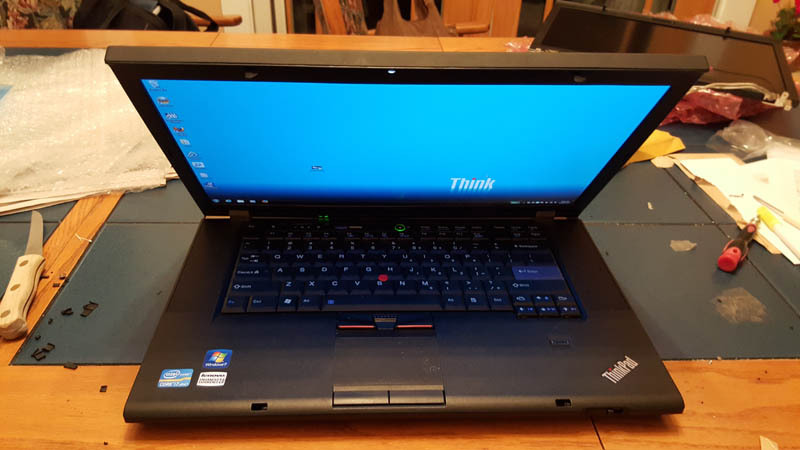 I've never seen a W520, otherwise I could try if a T500 lid can be made to fit. RealBlackStuff wrote: I've never seen a W520, otherwise I could try if a T500 lid can be made to fit. RealBlackStuff wrote: Problem is that WUXGA = [ 1920x1200, 16:10 and 15.4" ] and FHD = [ 1920x1080, 16:9 and 15.6" ]. 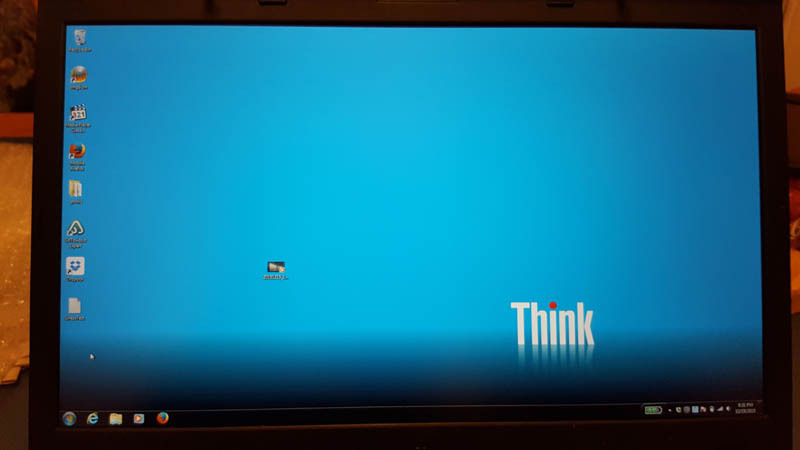 Yes, but look at the bezel below and above the screen on a W520 (or T520, T530, T510, W530, W510). That's 13,7mm less wide and 13,0 mm more height. Seems to me with every reduction of aspect ratio (4:3 > 16:10 > 16:9) we just gain more and more bezel. For me; the webcam in there is only second to the RJ-11 port in "least used". Trading it for more screen would be a no-brainer. 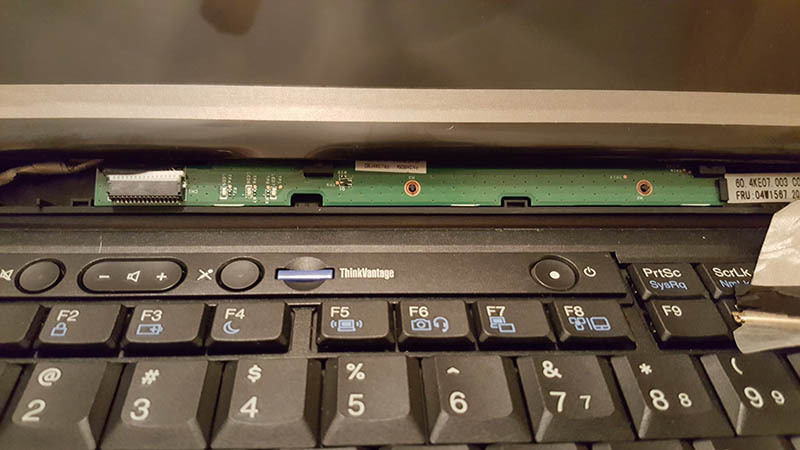 I did some looking at "compatible" screens on Panelook and noticed that there have been a number of revisions to the LP156WF4 SL B1, going all the way to B7, that use LVDS. Cetain iterations, namely B3, B5 and B7, show as a 300 cd/m2 brightness over the B1's 250. I'm considering getting the LP156WF4(SL)(B5). Anyone see anything that I'm not that indicates this panel shouldn't work in the same way as the LP156WF4(SL)(B1)? Also - it's much easier to find genuine screens on eBay if you use the parenthesis between the last two groups of digits in the model, or just put spaces in place. If I search for the entire model as one continuous string (or one with the last four digits all grouped together), all that comes up are "compatible" models. theterminator93 wrote: I'm considering getting the LP156WF4(SL)(B5). Anyone see anything that I'm not that indicates this panel shouldn't work in the same way as the LP156WF4(SL)(B1)? the screw holes and the connector position do not match. 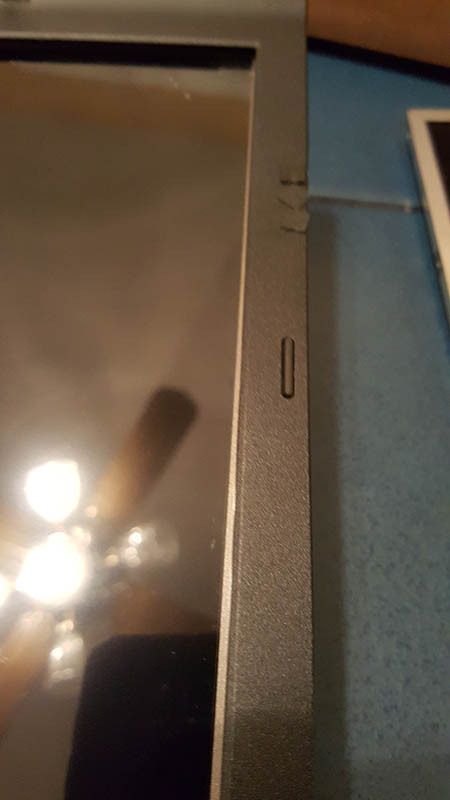 if there is a way to mod the screw position somehow, it should work. 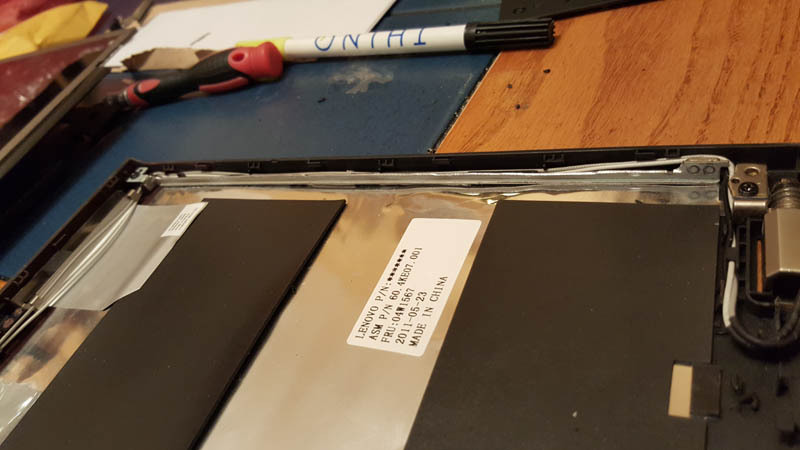 this lcd is probably thinner than the original one in the w520, so there will be an extra room to spare in the back, .. probably will help in case of modding a special mounting method. Hmm, I wonder if these are the same difficulties that had to be overcome with the original panel install mod, I did see references here to extending the cable and screw holes not aligning. Looking at photos of the two different panels (B1 and B5) it seems as though screw mounts and cable connection are in the same place (extension cable needed, link above); compared to the original AUO B156HW01 V4, the original LCD cable needs to come down and left to mate with the connector on the LG IPS panel. It does look like the AUO panel has side mount screw holes, rather than the "tabs" that are on the LG panel. Shouldn't be too much of a hassle dealing with that - although exactly how I decide to approach it will depend on the materials I have on hand and how motivated I am to come up with a fancy (or simple) solution. I think I might give it a whirl, and shall document the process thoroughly in the even I should succeed. Edit: Here we go... just bought the panel and a 40 pin connector extension cable. I'm optimistic about being able to make this work without too much hassle. Warning - links to large photos below. Well... the good news is the panel works fine when plugged in, is downright gorgeous compared to the original TN panel, and is only about half as thick and weighs noticeably less than the original. The bad news is... it won't work without more serious modifications, which I'm not comfortable doing. 1) The LCD display area is not centered in its housing. The screen is about 1/8" shifted to the left. Since the W520's screen is centered, this results in the display case hardware being visible by about 1/32" on the right, and about 3/32" of the visible portion of the screen is covered by the black plastic LCD trim bezel on the left. 2) This flavor of display has the electronics mounted on a "tab" below the screen, which protrudes about 1/2" from the bottom of the screen. This interferes with the microphones on the LED card and also blocks the center screw hole for the LCD trim bezel. 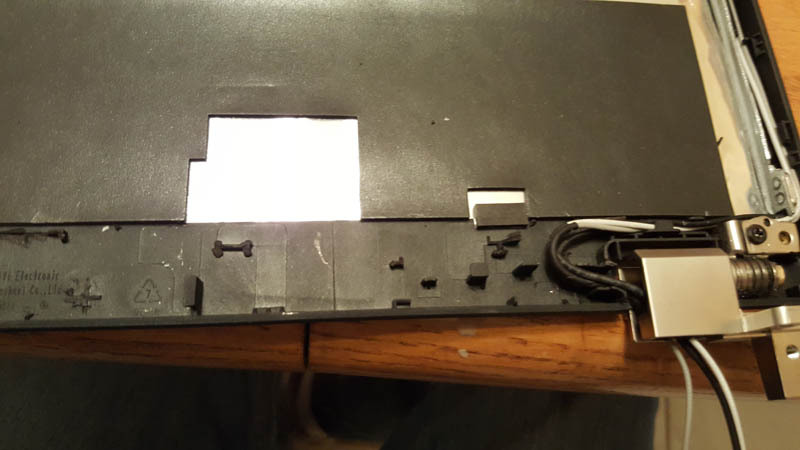 I took a peek inside the tape covering the electronics board to see if it could be relocated, and I didn't see anything which would support that desire. Most of problem 2 could be resolved if I decided I didn't need the built-in microphones; I could simply cut off the right 3/4 of the LED card, simply not use the center screw, and call it a day. Problem 1 is more of an aesthetic problem than anything else. Since there's about 1/16" of a black border around the active area of the screen, all the active pixels should be visible if the screen was mounted without modifying the horizontal placement. Nonetheless... the only way I could anticipate this being resolved completely would be by shimming the left of the screen to move it to the right. However... doing so would require you to also find a way to move the right screen mount arm further to the right. There are a few ways I could imagine doing that, but all involve metalwork which I'm not nearly proficient enough at (cutting the ends off, welding additional material, heating the metal to bend it at sharp angles, etc.). I'd keep this screen if I had a spare T520 or W520 LCD top cover/LED card and set of hinges/screen mounting arms to experiment on. But since I don't... I think I'll have to shelf this dream for now, or at least until I can acquire a cheap top cover to experiment with. I've not totally given up yet, so stay tuned (or share some ideas ). Last edited by theterminator93 on Thu Jul 27, 2017 6:33 pm, edited 1 time in total. i would try to cut the extra bezel that would cover the screen visible portion on the left. and cover the visible part of the screen housing on the right by black electric insulator tap. what you can use to cut the bezel is: 1. and old sharp kitchen knife or a screw driver. 2. a candle. heat the knife on the candle well enough, and it should cut through the plastic like butter. using a metal ruler, you can create a straight cut, you may need to reheat the knife in the middle because it cool down fast. and if possible try to stay off-wind of the fumes. try to see what that little board (with led lights and mic) it attached to in the back, you may find that there is extra unneeded plastic (in the lcd back cover) that is if removed ,you can keep the whole board intact while pushing it behind the screen, since the screen is thinner. doing the above 2 fixes, should possibly leave you with very little permanent modification, and putting back the original LCD (if required) is not that hard, although it may require a new bezel to look clean. 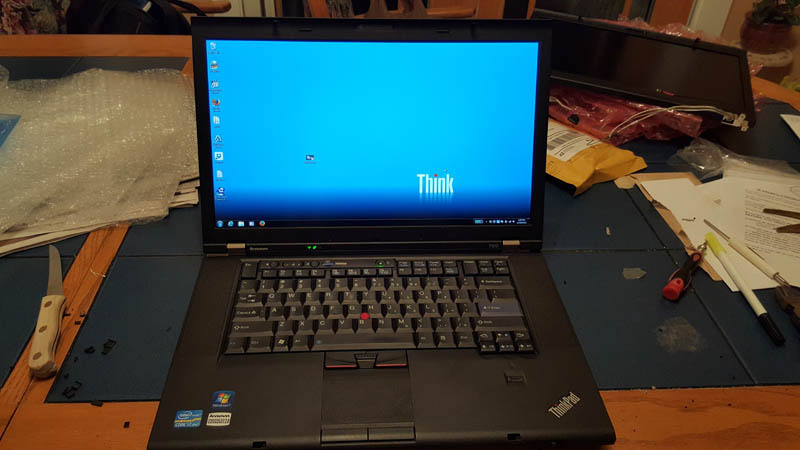 if those 2 fixes do not work, let me know, and i will open up my T520 bezel, and see what can be moved there ..
disclaimer: doing the above fixes, specially melting plastic, may have some health concerns, for example i am not sure if smelling those fumes is totally safe, please ask an expert on the subject. I had some extra time to think about the problems last night. I don't think I'll go straight in to cutting the bezel; I might first try to get my hands on a spare hinge to modify. Since the screen is about 2.5mm thinner than the original, I was thinking I could either heat and fold under or cut then reinforce the right hinge arm so the screen can pass over the top of it. I do have a brazing torch and have (potentially) the skill to cut the top portion of the hinge arm off then braze it to the bottom portion to ensure strength remains. Then I could nudge the screen to the right a little. As far as the mic/LED card at the base, if I don't have enough room to recess it more, I was thinking I might be able to cut the mics off and reposition them further down. 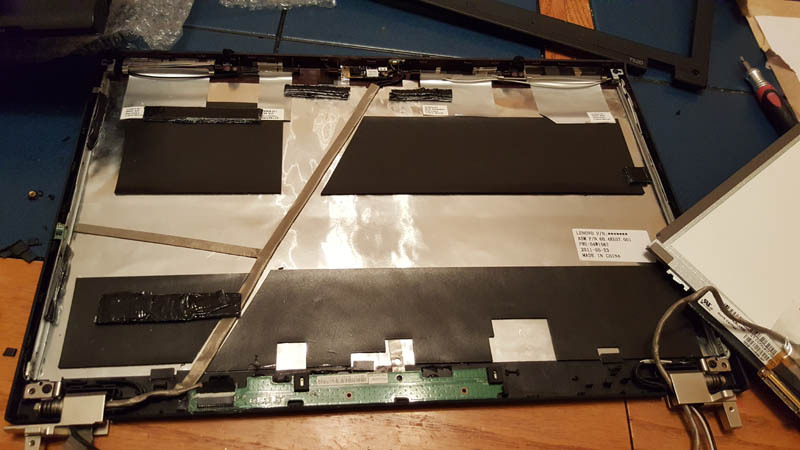 Or, I could (and probably should) open the protective plastic covering up over the electronics board on the IPS panel to see if there is anything interfering (electronically) in the sensitive areas that could be clearanced. I'm waiting for an LCD cable extension to arrive in the mail. Once that shows up and I confirm it's what I need, I will probably order some spare parts to experiment on so I don't destroy my original parts (I'm still using this machine daily). 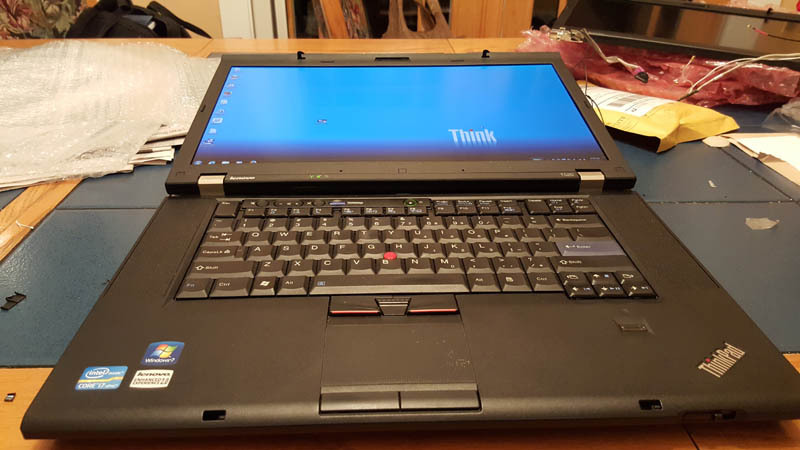 Looks like a complete T520 top cover with hinges etc. is only about $25. Is this the cable extension you're waiting for? That listing has ended but I think it shows exactly what you need. I actually ordered this one. Not sure how long it'll take to get here, but should be within a week I'd imagine. Cross my fingers and hope to die (preferably, I'd die after having see you having completed this:)). No but seriously, what you're doing is similar to what I was proposing for x220 some time ago, only that you're trying to stick in there a panel with almost the original size. 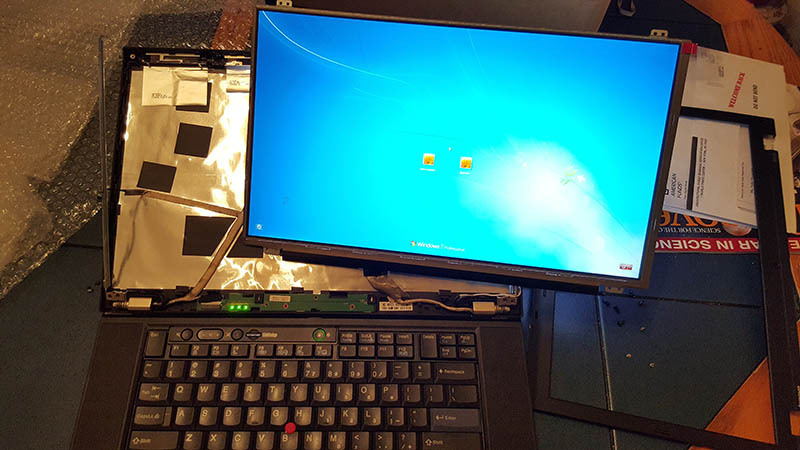 In my scenario, I wanted to kill half of the bezel, and make the x220 into 16:10. I still haven't found the panel tho, but I thank you very much for hinting panelook.com. I had no idea such a website exists. Good luck on this one! 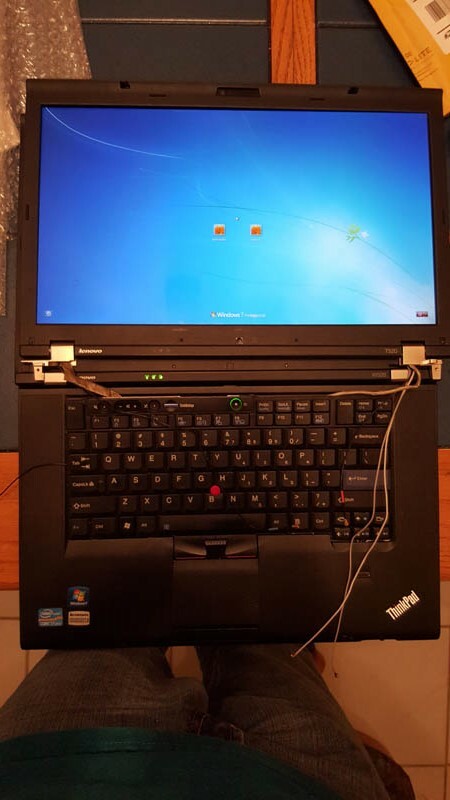 I'm still not sure (x220 has mount arms on the side, not top/bottom) do you need or not to cut off the mounting arms or are the screwholes in compatibile places? By the way how about superballsy idea to remove the LCD from its metal frame and replace with the previous one? Well, the good news in my case (aside from the screen being "Plug and play" as far as electronics goes), is that the screen fits perfectly in between the two rails in the LCD housing - about 2.5mm of foam padding or similar behind the screen will keep it flush with the front bezel, and securing it to the rails could be as simple as some high strength adhesive or tape. 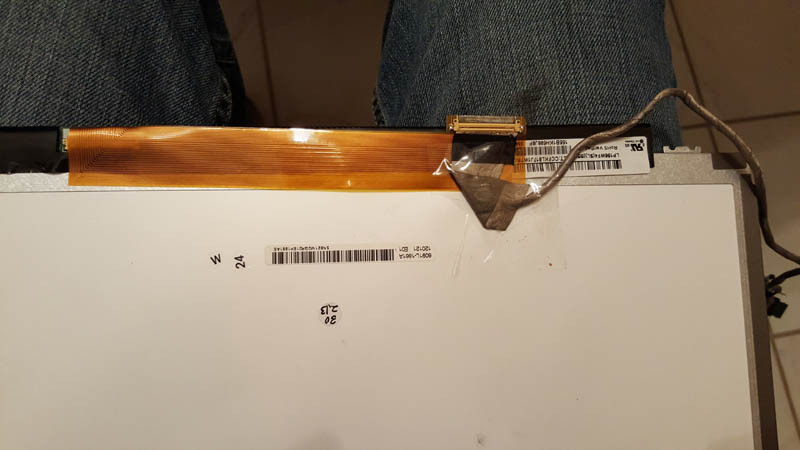 I'm hesitant to use butyl tape or other double sided tape to secure the screen to the back of the LCD cover because I want to be able to remove it later if necessary. The only physical conflict with installing the bezel over the screen is the microphone/LED board, but that's not a "mission critical" item and if needed, can be modded with relative ease. If I wanted to I could put the panel in there as-is and just live with the screen being slightly off-center - but I'm a bit neurotic when it comes to doing any sort of modifications. Unless it looks convincing enough to look factory, I am usually hesitant to do it. The new LCD mounting tabs don't look like they're in the way of anything so I might not need to cut them off. Not sure yet. Last edited by theterminator93 on Tue Jul 25, 2017 6:40 am, edited 1 time in total. Okay. Here's the "how it was done..." part. 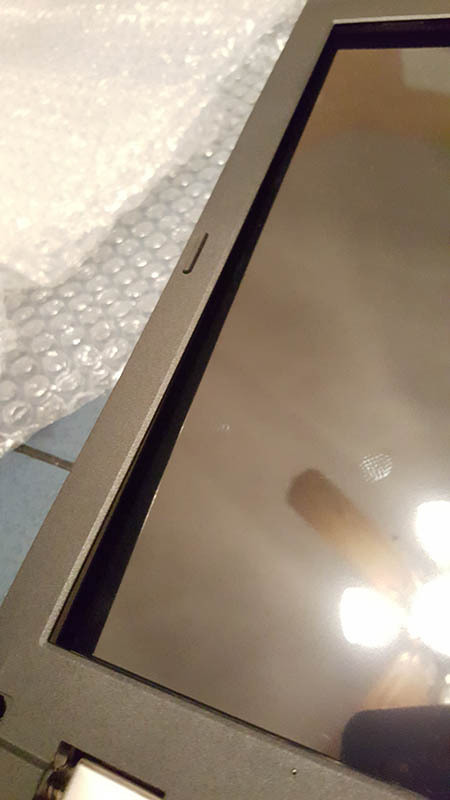 I have not yet found a permanent method to secure the LCD to the lid, so I need to take care to always open it with two hands (or open it in the middle of the screen, not on just the left or the right side) or else the front trim bezel pops open slightly at the bottom on either side. The only "casualty" of the modding process was the right microphone, where I accidentally slipped with the Dremel and ground through one of the traces on the microphone/LED card... but otherwise everything works and looks great! I used an LP156WF4(SL)(B5) instead of LP156WF4(SL)(B1) due to the slightly higher brightness (300 cd/m² vs. 250 cd/m² for other models of this screen; the factory AUO panel is 270 cd/m²). From what I can tell LP156WF4(SL)(B1) through (B7) are all interchangeable aside from their respective color/brightness/contrast characteristics. 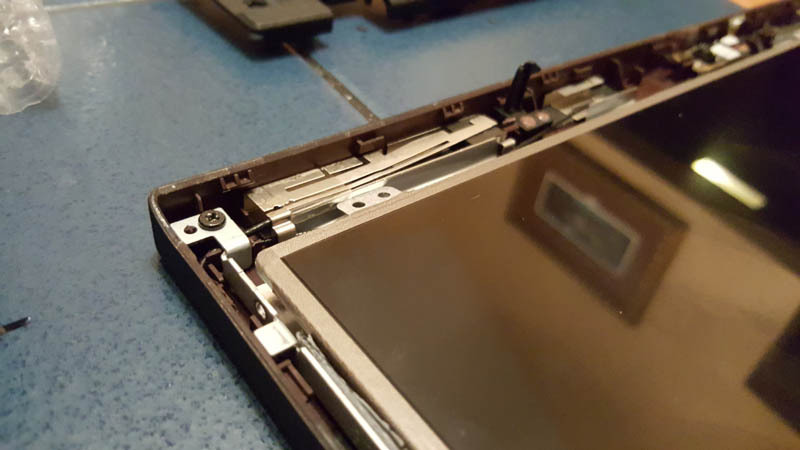 Modifications are required to the back of the LCD lid, the front LCD trim bezel, the right hinge, AND the LCD panel itself. All of the modifications are purely physical in nature, but doing any of this requires a good, steady hand as some grinding/cutting is required to make clearance. Also, as was noted above, you will need an LVDS (40 pin) LCD extension cable. Tools I used included a precision Phillips bit P000 and standard a standard Phillips P0, a hobby knife, scissors, side cutters, a hot melt glue gun, and a rotary cutting tool (e.g. Dremel) with a cutoff wheel and small grinder head bits. Take off the front trim bezel and remove the right hinge. Use a rotary cutting tool to slice in half, lengthwise, through the long arm of the hinge, from just over the attachment point to the hinge base all the way to just before where the top attaches makes a 90 degree bend. Use a grinding tool to deburr and soften the edges somewhat. 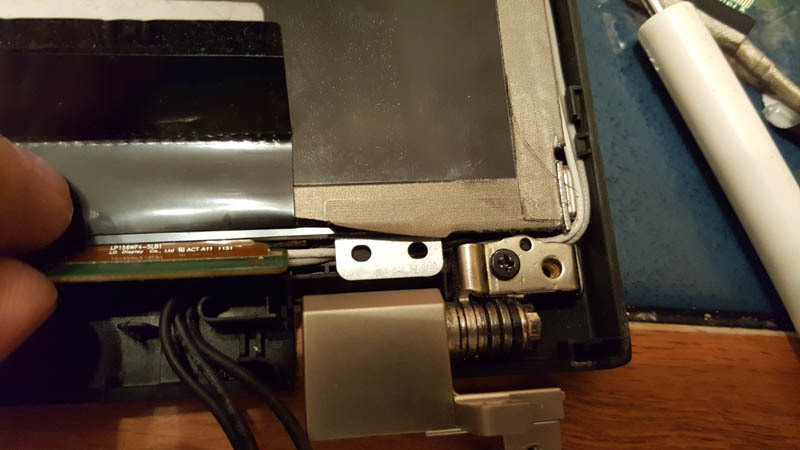 Return the hinge to the LCD cover. Break off/grind down all of the cast protrusions in the LCD front bezel along the bottom between the two areas recessed for the hinges - EXCEPT the "boxes" around where the three LED indicators go - including the center screw post. Also grind the upper, inner corners of the cutouts for the hinges down by about 1/16" (1.5-2mm), by about 1/16" (1.5-2mm) towards the outside edge but by about 1/8" (2.5-3mm) towards the bottom. This is required because the circuitry of the LCD is ever-so-slightly too wide to fit snugly between the interior plastic of the lid and will need to protrude through the thickness of the plastic. You won't see any protruding of the LCD circuitry when complete though. Break off/grind down the cast protrusions in the back part of the LCD lid along the center in the bottom, including the removal of the center screw post - EXCEPT the area around where the LED indicators are and where the "cable channels" near the hinges are. Also grind down about 1/16" (1.5-2mm) of the "J" shaped upper cable guides near the hinges on both sides. Do NOT grind down the small tabs at the very bottom; these will help keep the front trim bezel secured when it is installed since the center screw has to be sacrificed. All of this is to allow you to recess the LED/microphone card against the back of the lid and to give the circuitry of the LCD clearance. Grind back the top 1/16" (1.5-2mm) or so of the white LED/microphone cable connector. This is to give additional clearance for the LCD circuit card as well. 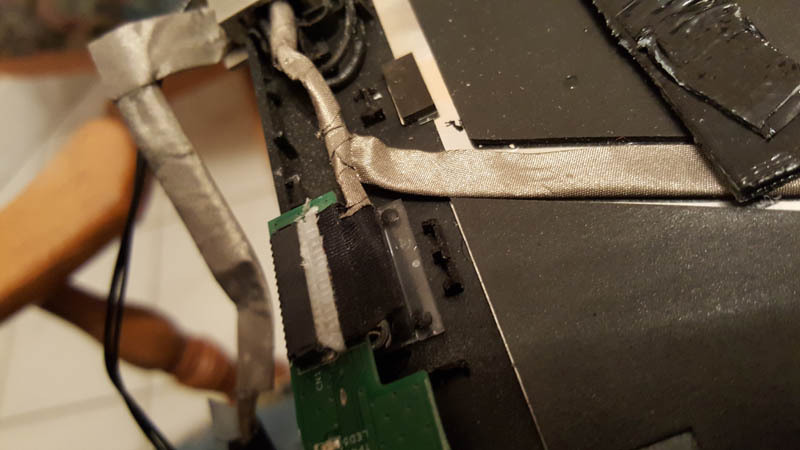 Be careful to not grind so deep as to reach the wires in the connector. This part we will need to modify the shape of a couple areas of the LCD to allow it to fit properly. 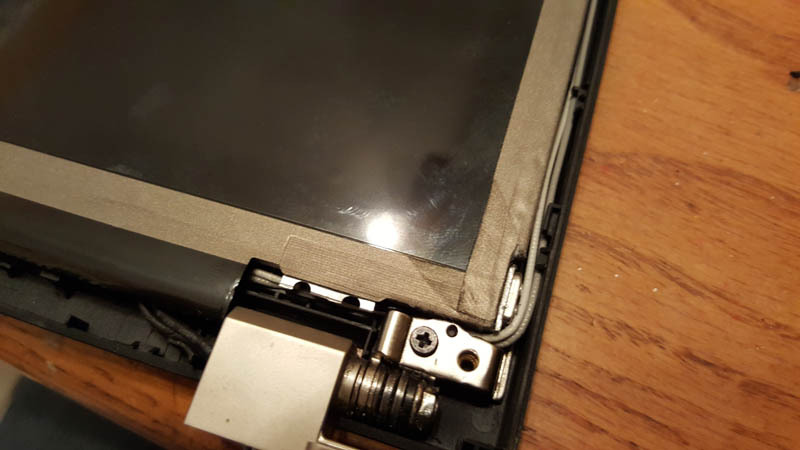 Use GREAT CARE when using a cutoff wheel here, as you certainly don't want to slip and damage any parts of the LCD that affect the visual quality of the panel! Gently lay the LCD into the lid so that it rests about with a 1/8" (2.5-3mm) gap between the left hinge and left side of the panel. It should be over top of the modified right hinge, but where the base of the hinge attaches to the arm you'll see that the LCD needs to be clearanced. Mark the area to remove, then carefully grind or use a cutoff wheel to remove this section of the panel. Don't go more than about 1/8" (3mm) into the panel from the side as you'll begin to get dangerously close to the electronics in the panel. The outer area you are removing is simply "dead plastic". 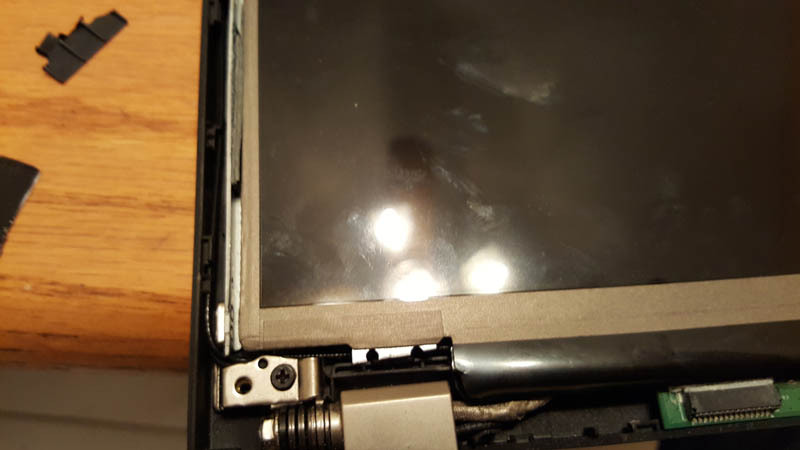 Return the panel to the LCD cover and ensure it now "drops down" and fits snugly. 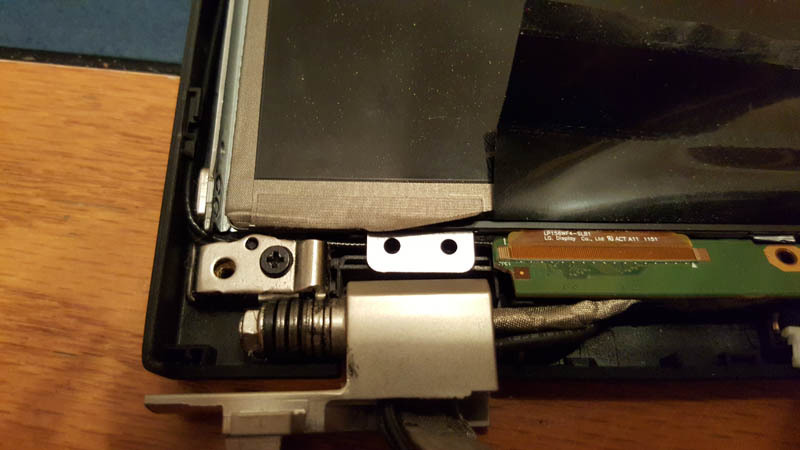 Break off the two lower mounting tabs on the LCD, then bend the upper two mounting tabs down slightly (perhaps 15-20°) but don't break them off. 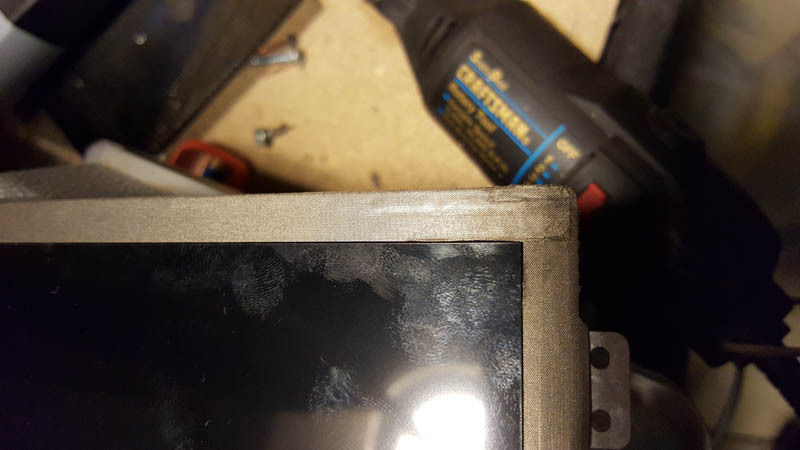 At this point you should have done enough clearancing to test fit the LCD into the cover assembly. With the LED/microphone card in, you may notice that it's difficult to keep the front bezel snapped in place along the middle of the bottom. Since there's no center screw anymore, you can choose to use some double sided tape in this area against the LCD to keep it secured. 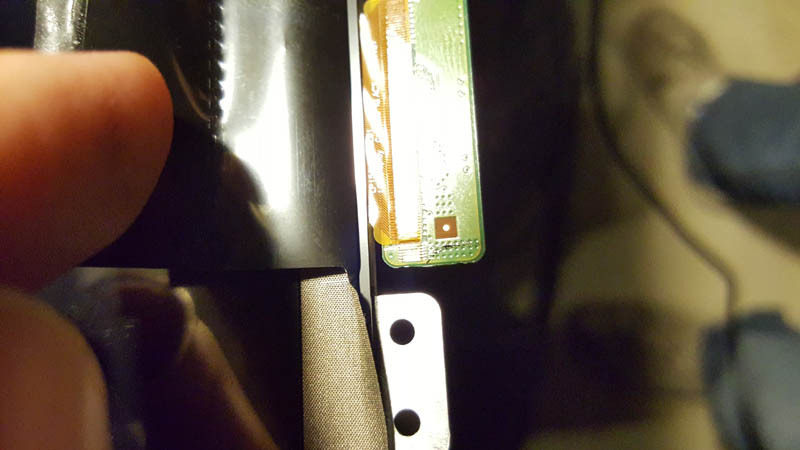 However, you may also want to consider gluing the LED/microphone card in place such that it is bent slightly in the area of the microphones so it is stays as close as possible to the back of the cover to give room for the LCD circuit board. To do this, get a hot glue gun and glue the three sides around the LED indicator "boxes" to the LED card under the connector. Then once this has cooled, do the same in a couple areas along the right portion of the card and try to bend the card so that the microphones are as recessed as possible. Don't go too crazy here; you don't want to break the card or lift the area of the card around the connector. As I mentioned before, I haven't yet decided how exactly I want to secure the LCD to the lid. Feel free to use tape, glue, epoxy, or come up with some clever way to use the original mounts with new screw mounts. I simply tacked a small dab of hot glue to the corners to hold it in lightly until I do something more permanent. I advise you test fit with the trim bezel in place to be sure everything lines up. Once you've secured the LCD to the lid, route the cable out the right hinge, put the LCD bezel back on, reinstall... and enjoy!! Last edited by theterminator93 on Sat Jul 29, 2017 12:08 pm, edited 1 time in total. If someone was serious about it, I certainly could do the mod for them. They would have their choice of how the LCD is affixed since I haven't yet decided what is best (although I have been thinking the I may just use double sided tape between the back of the screen and the LCD lid). Last edited by theterminator93 on Tue Jan 12, 2016 12:20 pm, edited 1 time in total. Any chance someone did this upgrade and now has a AUO FHD screen for sale? I still have the AUO FHD panel takeout from my W520. If you are interested (bear in mind the likely high costs associated with international shipping and import duties) PM me.